This is a list of breeds that have lines that are considered to be game dogs, also sometime spelled gamedogs. A dog that is game (gameness) is dog that is selectively bred and conditioned from an early age to develop traits of intense eagerness despite the threat of being injured. A game dog is a working dog, usually a hunting, herding, terrier or a bully type that will work until it drops, never give up, persevere and is ready and willing for anything. It is not necessarily the breed that makes a game dog, but the lines and the upbringing, meaning not all dogs of a breed are game dogs. Game dogs are the dogs bred and trained for intense work. Handlers who work a game dog have to know the dog's limits better than the dog does, as these dogs will work until they literally fall over from exhaustion. Dog fighters train their dogs from an early age to have gamedog traits. 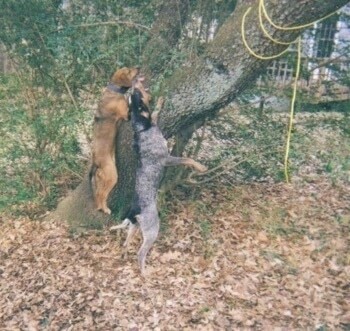 The fighting dogs that cannot perform are used as bait. 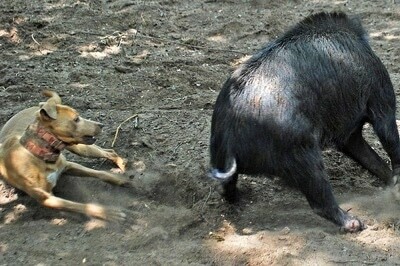 A lot of people mistakenly assume that a dog that is considered a game dog is a fighting dog. This is not true. 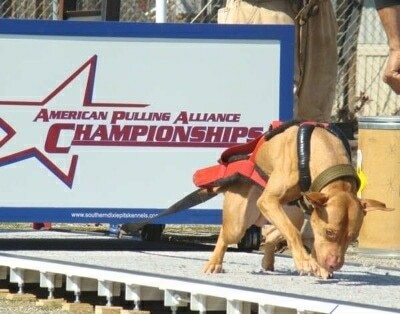 Even a game Pitbull may be bred to be game for the sport of weight pulling, hunting, tracking, herding or various working service-dog jobs, among other activities. If you know of a breed that has game dog lines and is not listed here let us know. "This is Martin's Stitch, a red-nose American Pit Bull Terrier. He had been pulling for 2 years when this picture was taken. He was named ADBA's 2007 dog of the year."